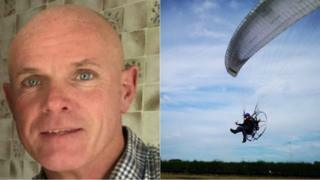 Image caption Andy Walkden was a "skilled pilot and instructor"
The heartbroken daughter of a paraglider killed in a crash near to the Royal Birkdale Golf Club said he died doing what he loved. Andy Walkden, 54 and from Southport, died when his aircraft crashed on land next to the town's famous course on Thursday, his daughter confirmed. Kayleigh Worthington said her father had only recently rediscovered his passion for paraglidging. Writing on Facebook, she said it was the most "horrendous time" in her life. Ms Worthington said he had "had a break from flying for a good few years" and that she wasn't happy when he started again. But she said he was a skilled pilot and instructor who had taught many people to fly over the years. "It was his passion and nobody could stop him doing it," she said. "We are all just in shock that this has happened at such an age and when he was so full of life." Ms Worthington said she felt like she was "in a dream". She added: "He knew my thoughts on him doing this, and how I felt when he recently got the passion back and started up again. "But it's what he loved, which is what I'm trying to focus on to get me through this horrendous time in my life." She ended her post with a picture of a broken heart before posting a series of photographs of her father with the message: "I love you, dad." The aircraft crashed at about 19:00 BST and burst into flames. Merseyside Police said a man was pronounced dead at the scene and that inquiries were ongoing. Royal Birkdale said the crash happened on council-owned land adjacent to the club. Mr Walkden is survived by his two parents, two children and four grandchildren.